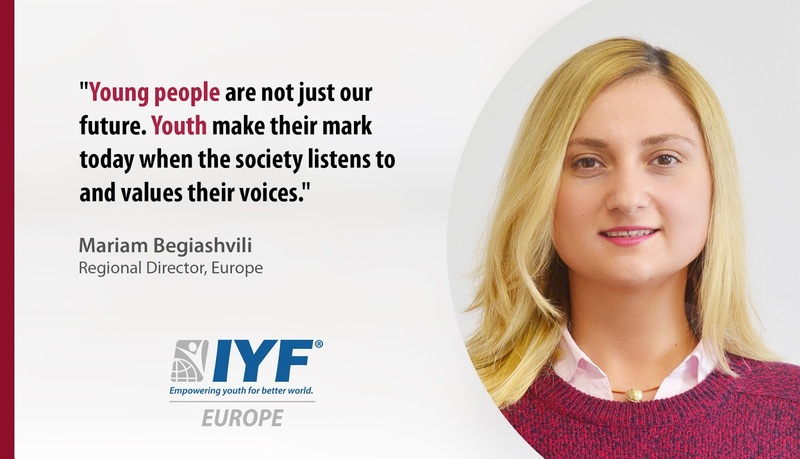 London, United Kingdom: In a statement issued today, the IYF Executive Board announced that Ms. Mariam Begiashvili appointed as Regional Director for Europe. As we continue our work for improving the status of the young people in Europe, we are pleased to welcome the appointment of the new Regional Director in Europe Ms. Mariam Begiashvili. She will be responsible for the development and execution of the regional strategies to build support for the IYF Representatives in the European region. “I am sure that Ms. Mariam will be added value for the IYF, as she will lead our operations and across the European States.” Said Ambassador Saeed ZAKI, IYF Secretary General. In a comment on her appointment, said Ms. Mariam: “Young people are not just our future. Youth make their mark today when the society listens to and values their voices”. Ms. Mariam is a Project Management professional with four years of experience in the nonprofit sector in Georgia. Her work experience has been exclusively in the nonprofit sector, focused on strengthening democratic institutions in Eastern Europe, civil society, refugees and displaced persons, youth, health and HIV/AIDS prevention. Her work has always been driven by the aim of delivering substantial results and achieving social justice in local communities. Throughout her career, she has helped raise funds from international donors through research and proposal writing for organizations that strived for sustainable development. Ms. Mariam holds a Master’s degree in Sustainable International Development from Brandeis University.